The fuel pump on my Yamaha F250 recently failed. My dealer reported to me that Yamaha refused to honor my warranty because “varnish” was detected on my pump. I was charged $1,600 for repairs. I was questioned about using ethanol gas. I confirmed that I use ethanol gas frequently. The manual recommends using marine grade gas but also notes that E10 is acceptable. I’m surprised that Yamaha is refusing to honor my warranty and also feel like the repair costs are excessive. What should a fuel pump replacement cost? Have any of you had similar experiemces? Im surprised that Yamaha is refusing to honor my warranty and also feel like the repair costs are excessive Does anyone have any suggestions? Was there varnish on the pump? How long had it sat between use? Not sure I have seen varnish and E-10 same vst. Post the pics up of the pump that the dealer sent to Yamaha. Does the fine print on the warranty paper mention anything about varnish? Warranty coverage language is vague at times and specific about other things. Denying coverage seems to be more commonplace from manufacturers and insurance companies, including health, liability and property. I'm curious as to what year is your motor and how many hours are on it? And how old was the fuel, and how long did the engine sit? mwgoldman and party marty like this. I would think a good dealer would have found something other than varnish. caper, BCPD199, zigzag and 3 others like this. How was varnish detected? Yamaha doesn't analyze this, they get their info from the dealers. - Post the Invoice, (Blank out the dealer). - Post pics of the pump. (There has to be pictures). - What year is the motor and how many hours. FWIW, is about the $327 for the pump, that's leaving you approx $1273 for labor and other stuff. 10 hrs, give or take to figure it out. OP, did you see the condition of the pump ? The Yamaha (and other companies') warranty statement says it covers workmanship and parts for a specified period. Yamaha did not put varnish or stale fuel deposits inside the fuel pump so it is not a parts or workmanship type of situation. The F250 owners manual also states if storing the motor for over 2 months that the fuel system should be drained or the use of Yamaha's Fuel Conditioner throughout the system. If your dealer did the proper storage procedure, then you may have a chance at the dealer taking care of the problem. If you did the storage or had a non-dealer perform it, or it was never done, then you may be out of luck. Here is a picture of what a severely varnished VST looks like from a lack of maintenance and a long storage term. wajski, THT Mod 9, ghostrider III and 2 others like this. Last edited by seahorse; 12-09-2018 at 05:38 AM. WOW. I would have to say this is not a Yamaha problem. What the heck were you burning threw that engine? How long did it sit? I always use a little canned pumpkin as a fuel conditioner in the winter. Matt B, SeaCat22, bladenbullet and 8 others like this. LOL and this is the season for pumpkin. THIS IS NOT THE OPs VST. 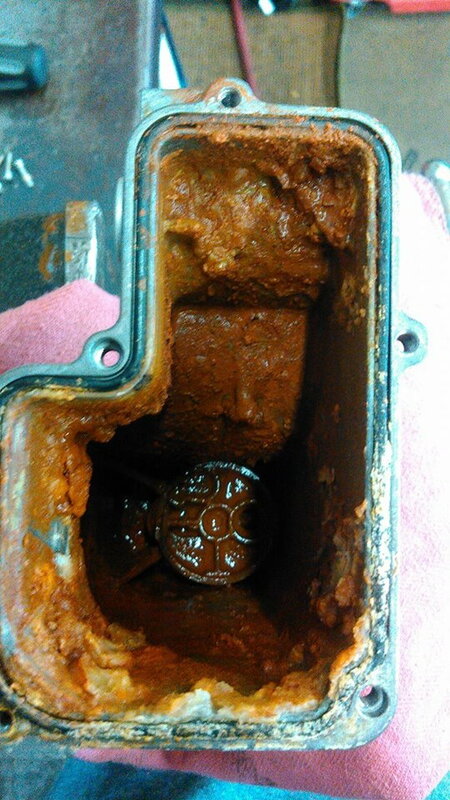 IT IS AN EXAMPLE OF WHAT CAN HAPPEN IF YOU STORE YOUR ENGINE IMPROPERLY. Here is a picture of a severely varnished VST from lack of maintenance and a long storage term. That would be a crooked dealer. If they would screw Yamaha they probably screw some of their customers also. bladenbullet and THT Mod 9 like this. The dealer owes his allegiance to his customer always. Sometimes a problem is clear cut. Sometimes a problem is not all black and white and the dealer has to guess. In the latter the dealer should guess in favor of the customer. Kenner 23 and Chimpo like this. Does the Yamaha warrantee specifically exclude problems that they deem to be due to fuel contamination? If so then this may fall into that exclusion category, but if the pump cost a bit over 300 bucks how do they get up to the price you paid? Were other components replaced also? Last edited by LouC; 12-09-2018 at 07:04 AM. Dealer probably spent a ton of hours troubleshooting, then figured out the pump was shot and realized he was only going to get "warranty money" which is probably not going to cover his costs... And here we are. Looks like varnish sir. caper, zigzag, 6104696 and 2 others like this. Are you suggesting that a dealer commit fraud? If a dealer will commit fraud against his supplier will the same dealer defraud his customers?